I Me My: Stephen Kinzer's "All The Shah's Men" - Documents the 'Folly of Attacking Iran'? Stephen Kinzer's "All The Shah's Men" - Documents the 'Folly of Attacking Iran'? It was in the back drop of this current stand off that I started reading Kinzer’s book, the title of which is a take on Nixon’s Watergate scandal made famous by the movie titled “All the Presidents Men”. Kinzer’s “All the Shah’s Men” is no less of a Watergate as it is based on findings from CIA documents that were released to the public in 2001. These documents revealed how the CIA conspired with the British government to oust the Mossadegh Government in Iran during the 1950s. Mossadegh, was a popular nationalist who believed, "The Iranian himself is the best person to manage his house" and thus became a thorn in the side of the British who according to Mossadegh were 'bleeding Iran dry through the Anglo Iran Oil Company". The book reveals how much money, time, and effort were put in to get rid of Mossadegh who by then was a world icon having made it on the cover of "Time" magazine. The British called it "Operation Boot' and the US termed it Operation Ajax, but regardless of its name, the operation is a real eye opener to what and how much the CIA can do, even on foreign soil! The key figure in the operation was CIA agent Kermit Roosevelt, the grandson of President Theodore Roosevelt. Roosevelt planned and implemented Operation Ajax which involved bribing influential figures, planting false reports in newspapers and provoking street violence that had some 300 people dead on the streets of Tehran in less than three hours. Operation Ajax was basically about masterminding a coup that would overthrow Iran’s elected Prime Minister, Mossadegh, who having nationalized Iran’s oil industry, had angered the British Government which had until then owned and run Iran’s oil production. Roosevelt’s coup in 1953 did bring an end to Mossadegh and also diffused the tension of Britain attacking Iran which to the Americans was a bigger threat as it would threaten to bring Soviet Russia into the picture. With Mossadegh gone, the British could heave a sigh of relief and keep their control over the Anglo Iran Oil, and that would eliminate all possibility of communist Russia taking over Iran’s oil wells in case the British were to leave. Operation Ajax definitively put Anglo Iran Oil back into the hands of a consortium of nations that included the British, the Americans, the Dutch, and the French. In addition, it ushered in a quarter-century of relatively calmer dictatorial rule under a young and insecure Shah who depended largely on US funding and resources. Kinzer claims that Operation Ajax lead to a politically weak and desperate period for Iran which brought in heightened Islamic militancy in Iran and that eventually became a mainstay of the region. 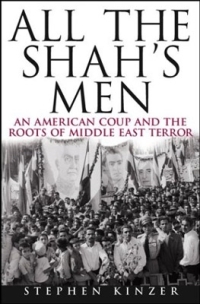 All the Shah’s Men is a very engrossing read that rivetingly tells of a CIA driven foreign coup to ‘control Iranian oil fields, over concerns of Iran coming under control of Soviet Russia’. It provides the reader with once classified information about Operation Ajax which is ‘now regarded as a mistake that has compromised U.S.'s ability to defend democracy around the world’, which certainly makes this book a very relevant read! The Preface titled “The Folly of Attacking Iran” is a delectable read by itself! "As militants in Washington urge a second American attack on Iran, the story of the first one becomes more urgently relevant than ever," Kinzer writes in his new essay. "It shows the folly of using violence to try to reshape Iran."